Finally, the national media is starting to pay genuine attention to what is going on in Madison, Wisconsin. We are now starting Day 6 of peaceful protest over the newly elected Republican Governor's plan to break the state worker's unions. The crowd yesterday was the largest so far, and while I have not seen an official estimate, I guesstimate it at 40,000. My estimates all week have been pretty close, so if I am off, I will put in a correction later. Let me state - categorically and emphatically - that this protest is not merely about wages and spending cuts as the Governor would have people believe. There is a fiscal crisis in Wisconsin only - ONLY - because this Governor created it in six short weeks. What this protest is about is a concerted effort by the Republican party to break unions across the nation. As goes Wisconsin, so goes the nation. Why does that matter? What good are unions to you? Let me explain. There are the usual selling points that unions brought us fair wages, weekends, 8-hour workdays, child labor laws, and so on. Those are surely important to most of us. But this is more insidious than merely wanting to have an easier time of controlling wages. Seven of the Top-10 donors to political candidates in 2010 are PACs representing Corporations and assorted billionaires like the Koch brothers. They contribute - primarily - to Republican candidates. The other three donors in the Top-10 are labor unions who donate - primarily - to Democratic candidates. Break unions, state by state, and in short order, national elections will be solely funded by Corporate interests and Republicans will win all elections. It is as simple as that. The unrest in Wisconsin this week over Gov. 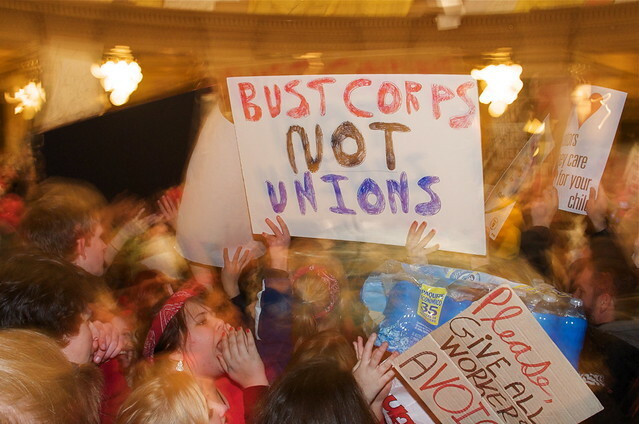 Scott Walker's plan to cut the bargaining rights and benefits of public workers is spreading to other states. 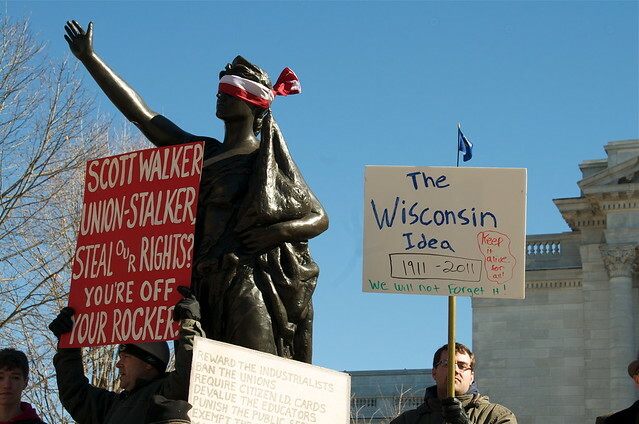 Rush Limbaugh has been stirring the conservative voter pot for the last few days, and last night buses began rolling in to Madison bearing Tea Party and Republican counter-protesters. That is fine, democracy can use open discussion. 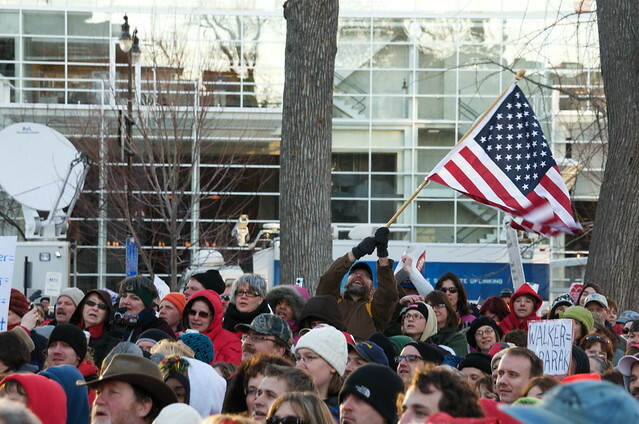 Let us remember though, that this rally generated tens of thousands of home state protesters. The counter-protesters are being bused in from other states. There are photos from yesterday - Day 5 - in a SLIDE SHOW. There are also photos from prior days, but the newest ones are first in the set.